Due to the crowd we didn't get much done either. First stop was the same as day one, to eagle games for Dion to buy Francis Drake. He found a friend to ship things back so he kinda went a little crazy. Ended up succumbing to the Amerigo hype and bought the game un-demoed. 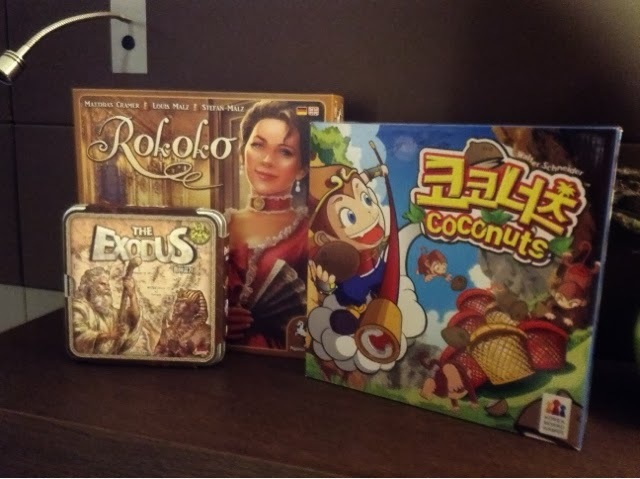 He also bought a few kids games for his grandson. What a granddad. Don't tell him I actually said nice things about him. Haha. The nice things about conventions is that you get to see all sorts of quirky stuff and collectors stuff that you don't see on normal days. Above is the lets catch the lion set, it's counterpart gummy set, and it's travel set. 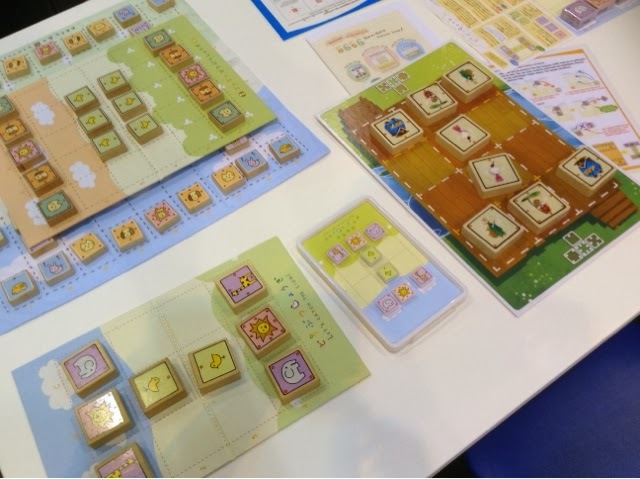 They also have a reskinned version which is also very nice looking. I just love the Japanese art style and packaging. Very cool indeed. Among other big stuff I saw yesterday, I left out the big version of rampage. It's bigger than the normal size obviously, but I'd always thought it would have been much bigger. I would love to give it a go so maybe I'll head down there tomorrow. Fat fingers like mine could use a nice big board and bits to play with. Due to the crowd we didn't get to try many games today. We did get a few turns of Citrus though. It's a tile placement game where players are trying to manage their tight money and number of workers. Each turn you will buy a row of tiles that intersect with each other. It costs a dollar per tile but once you buy a row it makes another row cheaper for the next player due to the intersecting nature. Once bought he tiles are placed immediately and workers are assigned to them. Points are scored by surrounding fincas on the board and by abandoning your fields. You will choose to abandon your fields as that is the way to replenish your money and to score points off your fields. Some placement on the board will grant you bonuses or extra actions when you cover certain spots on the board. The game was easy to learn and actually a pretty decent game. The only issue is that it doesn't do anything that hasn't been done before and it will naturally feel like you've played a similar game somewhere sometime. It's not something I would pick up at full price but if the price is right I'll be up for it. Believe it or not, that's all I manage to get in today. I walked a lot, squeezed with a lot of people, and ran around looking for available booths to test out a game but to no avail. We did however have a very quick lunch with Eric Lang ( of quarriors fame ). He's a really nice chap and managed to get insights into the world of game design. About how he comes up with his designs and how ideas jump up at him even after he puts the idea at the back of his mind. Also, learning about how companies handle expansion projects was also very insightful. Wish we could have had more time but he was truly a busy man. We spent a little more time in hall 2 today maybe due to he fact that it was less crowded than halls 1 & 3. I stopped by to admire the handiwork of the many artists at the artist corner. I really appreciate great art and all the works there really puts a smile on my face. What we focused on in hall 2 however was the Cornish Smugglers booth. We didn't managed to get in a demo as it was booking based only. 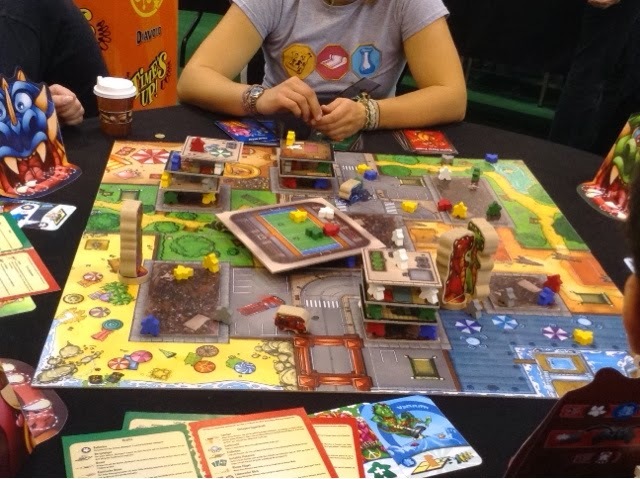 But we got a really great overview and rules explanation and the vibe around the booth was nice. The game was selling like hot cakes and well, no surprise that we left with a copy of the game. It sounds really interesting and I would like to try it out soon. I'm not sure how well it will sit with my own group so I decided against the purchase. Hope i won't regret that in time. Well that's day 3 in a nutshell. Very uneventful I would say. For completeness sake I will finish up what I left out for my day 2 excursion. I managed to get in a demo of Sanssouci. This game fell into my radar only a few days before I flew off to London. 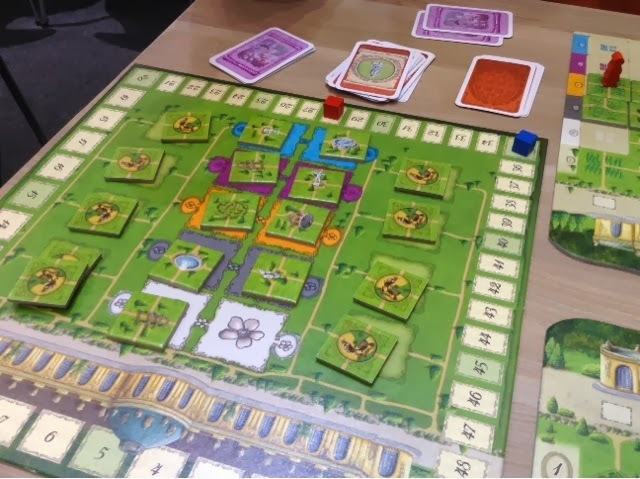 I liked the garden building aspect of the game and it seemed like something that is easy to teach and get into. In Sanssouci, players play cards to obtain tiles from the board. The card will show either a color ( or two ) or a particular building type. This tells the player that he/she may either take a tile from that particular color slot or to take the tile of that particular building. The placement of the tile is also dictated by the tile you took. If it was located at the white color slot, you have to place it on the white row of your player board space and at that particular building type column. After placing a tile you may use your workers to take walks in the garden. The further in they walk, the more points you get. You also get points at the end of the game for completing rows and columns and for your end game cards. The player with the most points is the winner. Each turn you have 2 cards in hand which means you basically only have 2-3 or 4 options on tile selection. Dion hated the game. Totally disliked it. I on the other hand, enjoyed it enough and felt that the game was very relaxing and the pace was easy going. We finished our two player game in slightly over a half hour. Dion insisted that the game plays you, which is partly true, but I think there is some tactical decisions to be made. I think it could have been improved if players had 3 or 4 cards in hand but that might lead to AP in some people. I had considered buying it actually, but it's now sold out. So does that mean it's a good game ? Well, that would depend on your preference. 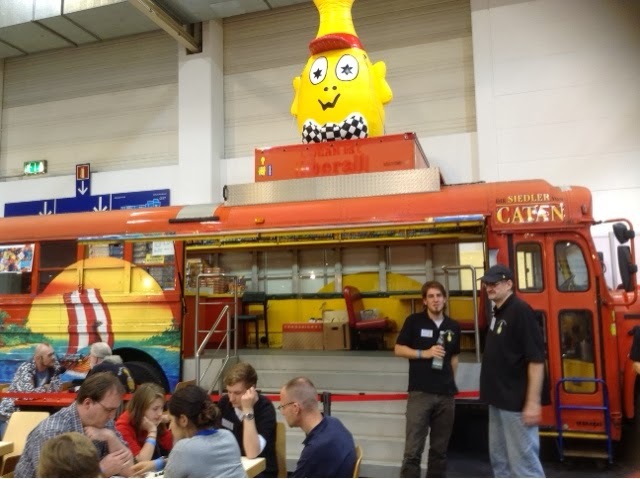 I think it's the level of a lot of Spiel des Jahres games. Very light hearted and for family enjoyment. Do give it a try and I think if you just play it for enjoyment and not some brain burn, you will come out of it just fine. The artwork could use some improvement though. Pretty bland to me. Along the way at hall 2 I saw a small 2 player game called Assaultous ( if I'm not wrong ). It's a mix of catan and chess. Players have workers on the board that serve as fighters and producers. 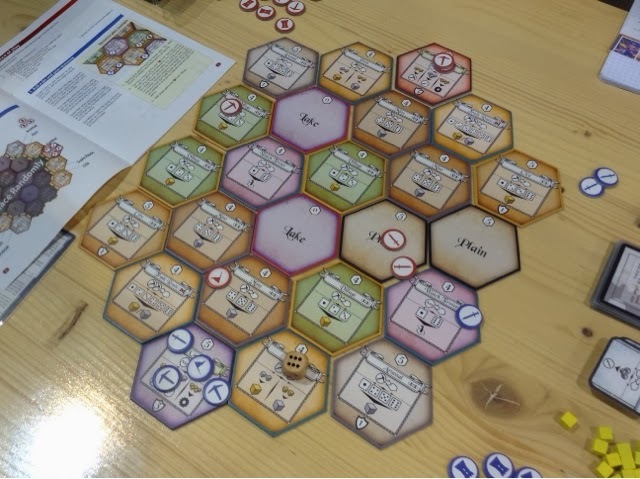 Each turn you will roll a dice and if you worker is on a production space, it will produce resources according to the number rolled. These resources can be used to buy more workers and barracks so that you may hire workers at different areas on the board. You may also upgrade some areas on the board so that better or more resources will be produced. The aim of the game is to wipe out your opponent's commander. So with the worker you may launch assaults and battles are simple, quantity wins. I didn't demo it but my concern is the battle area. If you win you don't lose a single troop. So 3 vs 2 means that the 2 troops die and the winner survives with 3 troops unscathed. I think one mistake is gonna cost a player the game. Pretty strange battle mechanics. Not too keen to explore further. 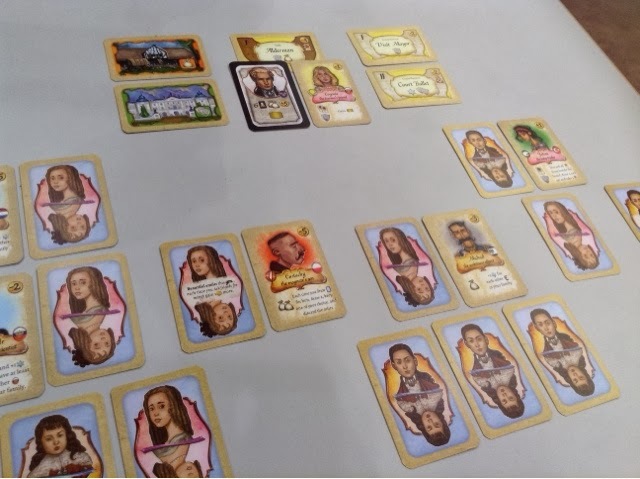 For our day 2 gaming session, we ended off with a game of legacy: testament of duke de crecy. 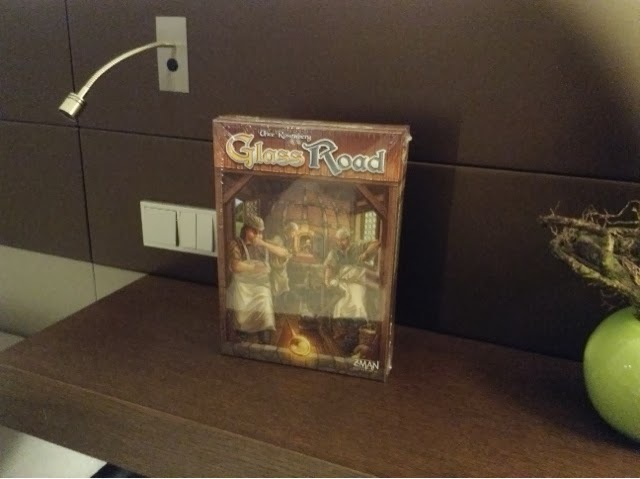 I tried my best to teach the game with my previous experience of reading the rules. I think we got most of it right but I'm sure I screwed up somewhere. I've been wanting to play this and I'm glad we got a game in. In legacy you're trying to build up an amazing empire of your family. 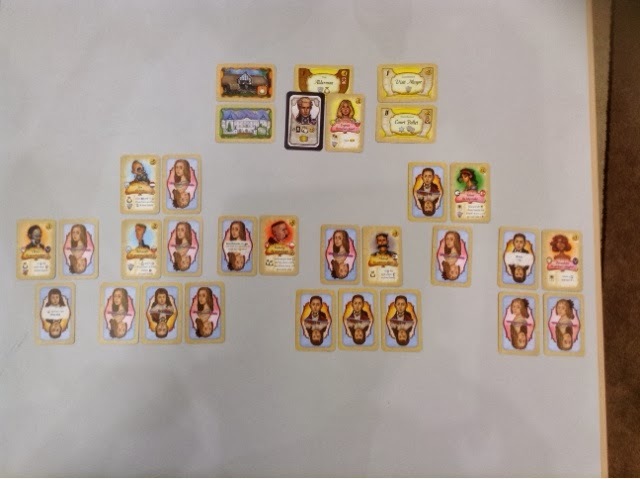 The game has 9 rounds and though worker placement actions, players are trying to have children and marry them off for the sake of victory points and other benefits. The game is truly unique and it's hard to explain how it plays out but as you can see above, you're slowly creating 4 generations of your family throughout the duration of the game. You gain points by having more children and by marrying them to the right type of people. There are combos within the the cards of the friends that you have chosen for your children. For example, some friends give pions or income if you have other friends of the same nationality in your family tree. The game played well but I wasn't blown away by what I saw. I will need more plays to decide how it sits on my spectrum of games. While playing I kept feeling like the card combos are not truly efficient and that trying to build around the abilities was a waste of time. It was fun having children and treating them like pieces of meat ( no, I am not like that normally :P ) but it was difficult to do anything with usually just 2 actions per turn. Legacy is nothing to shout about currently but I think it's worth a more in depth look to see if the different parts can fit together well. Well, last day tomorrow ! Hopefully there are still gems to uncover.